Getting a license for disabled driving involves having the proper handicap driving modifications and meeting the test requirements. Find out more. Disabled driving is very much a real possibility. With some special modifications to any vehicle, you can be driving very easily and safely among other drivers. Getting a driver's license when disabled is not much different than for those who do not have a handicap. Everyone who wants to obtain a driver's license must pass both a written and a driving test. 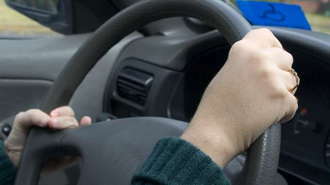 The written test can be accompanied by a driver's education class, but this is not required. Once you have taken your written test, you receive a learner's permit so you can practice driving until the actual road test. In order to be issued a driver's license, you must show the licensing authority you not only know the rules of the road, but that you can safely drive a car without any hindrances or obstructions. This means special steering wheel hand controls, including throttle, braking, signaling and steering, must be installed. In some states, a second set of controls should be included in the passenger seat. Once you have shown your car has the required handicap driving modifications made to it, you can take the driving test. If you pass this test, you will be issued a driver's license. After you have passed the driver's test, there are no special requirements other than having a special license plate and a placard to hang on your mirror that specifies you are disabled. This is not to single out a disabled driver, but to let others know in case there is an emergency or some other problem. The minimum age to drive a motor vehicle is 16-years-old, but those who have a Disability Living Allowance are eligible to take driving lessons at the age of 15. Remember that all new drivers must take professional driving lessons before applying for a license. Disabled drivers must look for a qualified instructor that will cater to their various needs. The Vehicle Must Be Modified to Accommodate Your Disability. As mentioned above, the car has to be altered to fit the needs of the individual who will be driving it. All the modifications should comply with all federal and environmental laws, and should be carried out by an authorized agency. Book your theory and practical test applications in advance. The theory test usually consists of two parts: a multiple choice section and a hazard perception skills section. Only when you pass the theory test are you eligible to take the practical test. Different theory tests are designed to cater to any disability you might have. The test could be offered on video for those with hearing impairments and is available in both written and spoken formats. The practical test should be carried out with a professionally licensed instructor who specializes in disabled driving training. If you are in need of a car for disability driving, you need to have certain modifications done to the vehicle. The modifications will of course vary depending upon your disability, but below are some requirements you should follow. Handicapped driving law refers to the body of statutes and regulations that deal with disabled individuals operating motor vehicles. Although the definition of disability can vary according to state law, it generally covers individuals who have lost the use of one or more limb and need special equipment to operate their vehicles. This equipment includes wheelchair ramps or lifts, as well as hand controls for acceleration, braking and steering. Handicapped driving law is enforced at the federal level by the National Highway Traffic Safety Administration (NHTSA), and at the state level by the Department of Motor Vehicles (DMV). In most cases, these laws provide special exceptions or privileges to accommodate disabled individuals. These rules govern access to handicapped parking spots, licensing for disabled drivers and waivers for hand controls that would otherwise be illegal. These special rights may not be available to fully ambulatory drivers. The ADA was passed in 1990 and amended in 2008. It protects individuals from discrimination in employment and provision of public services. The act mandates that construction of new public buildings ensures accessibility for disabled individuals. In practice, this usually means that the property must have designated handicapped parking spaces and wheelchair ramps. The parking space must be at least 8 feet wide, with an adjacent striped loading zone that is also approximately 8 feet wide. Additionally, state DMV's are prohibited from denying an individual a license solely because they are afflicted with a disability. Finally, individuals with mobility-limiting disabilities are entitled to pay the self-service price for fuel at a full-service gas station. Each state may take its own approach to granting licenses to disabled drivers, but any driver who can pass the necessary exams with reasonable accommodation is eligible to receive a driver's license. However, the driver is obligated to reveal their disability at the time of license application. The state DMV is entitled to grant a restricted license, depending on the nature of the disability. Restrictions are based on vision loss, hearing loss, and limb loss. The state DMV also grants handicapped parking permits. To obtain such a permit, the disabled individual must simply fill out an application and have it signed by a physician. State and federal law governs the installation of adaptive equipment on passenger vehicles. In some states, it is illegal to install spinner knobs on steering wheels, or to install hand controls on manual transmission vehicles. Installation of mobility equipment must be performed by an approved vendor, especially if the disabled driver is seeking funding from the Department of Vocational Rehabilitation or the Veteran's Administration. Approved vendors must complete a certification and licensing process similar to other professions. Originally, the NHTSA prohibited shops from making modifications that put a vehicle out of compliance with federal safety standards. Since wheelchair conversion generally involves removing seats and modifying the vehicle frame, an exception was issued in 2001. Equipment installers are allowed to break specific standards, but these exceptions must be absolutely necessary, clearly labeled and documented in the shop's records. The shop must inform the vehicle owner of the exceptions in writing. Which States allow Steering Wheel Spinner Knobs? Popularized in the 1950s, before power steering was widespread, steering wheel spinner knobs, the "suicide knob", or "Brodie knob" allowed people to steer their car quickly and more easily. The problem with this type of spinner is it can as easily unwind as wind, making it more dangerous to use. In some cases, though, where people have handicaps, it is the only way that they can steer their cars. On some big rigs, the spinner helps the driver to maneuver around corners by using mirrors. For the most part though, unless you are handicapped, most states have outlawed spinners. Does it Cost Money to Get a DMV Handicap Parking Permit? On average, a DMV Handicap Parking Permit costs between $20 and $40. This is a special handicapped parking placard that you place on the mirror of your vehicle when you park, or on the dashboard. In order to qualify for a handicapped parking permit, you must have a letter from a physician stating that you do have a handicap and that you need the special spaces near the front of parking lots that handicapped parking placards offer. Handicapped parking placards are issued for specific periods, from months to about a year, before you are re-examined by either your physician, who must renew your letter, or by the DMV.